Damocles 1208 provides digital inputs (DI) and digital outputs (DO) that can be remotely controlled over the Web. Inputs and outputs can also be controlled over the network using M2M protocols (SNMP, Modbus/TCP, XML over HTTP). 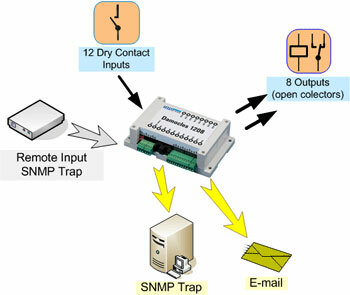 When an input dry contact state is changed (closed/open), Damocles sends an e-mail with customizable text and/or a SNMP Trap. Box-2-Box mode lets you use a Damocles unit as remote outputs. Outputs of the Damocles unit signal the OK or Alarm states of sensors and inputs at other devices. Any Poseidon, Damocles or HWg-WLD device can activate the outputs of a Damocles 1208 unit over the network. This feature does not require any so ftware. Energy consumption monitoring: counting of pulses from electricity / water / gas meters. Conversion to price using HWg-PDMS in MS Excel.